Yes, it’s only March and round one hasn’t been completed, however this afternoon at Etihad Stadium, one of the most successful football clubs of all time awoke from a decade-long slumber. Facing an opponent who was widely tipped to be one of this years major contenders, today’s match was the ultimate test. It was an opportunity to see whether some promising pre-season form could be sustained and produced when matters most… It was a test which the exciting Bombers passed with flying colours. The final margin of 55 points is somewhat flattering for the Bulldogs who were outclassed by a young, fast, determined Essendon outfit, seemingly inspired by the return of past premiership captains James Hird and Mark Thompson to Windy Hill. The first quarter was a close contest with Essendon making most of the play yet wasting numerous opportunities in front of goal. The Bulldogs however made the most of their chances and took a slender 3 point lead into quarter-time. From that moment on however, the slick Bombers scored 13 of the remaining 17 goals and dominated the play in a way which hasn’t been seen since the early 2000’s. The main source of encouragement for Bombers fans lies in the form of their younger, less experienced players such as Jake Melksham, Leroy Jetta, Dyson Heppell and Stuart Crameri. The level of flair and skill which they showed today was of a level usually seen by much older, more experienced players such as the great Geelong side of 2007 and the brilliant Collingwood side of 2010. In addition to this, second-tier players such as Monfries, Zaharakis, McVeigh and Winderlich all contributed evenly as did the upper-echelon stars like Watson, Stanton and Ryder. Together, it was a brilliant team display and one which would certainly have rival teams worried. Clearly impressed by what was being shown, the punters jumped on board and by the end of the match, the TAB had suspended premiership betting after Essendon slipped into third favourite by half-time. Prior to the match, Essendon were paying $41 to win this years premiership and $9 to win the wooden spoon, three hours later and those odds are likely to be reversed when betting re-opens. Despite the hype, premiership talk is certainly premature, as is talk of finals. It’s worth noting that Essendon defeated the Bulldogs last season as well as accounting for the over-rated Saints on two occasions. This after all is just one win to accompany a successful pre-season, there are still 23 rounds remaining and many challenges lie ahead. Whether a finals appearance occurs this year, next year or the year after that is irrelevant, the important thing now for Bombers fans is that there is finally some hope after a disasterous 2010 season. James Hird and Mark Thompson are two of Essendon’s favourite sons and two men who enjoyed multiple premiership successes wearing the red and black. There is a level of respect shown from their players which quite frankly, wasn’t shown to Matthew Knights and the improved results of this are obvious to see. The young playing group, very similar to that of previous seasons, seem inspired, passionate and look to be enjoying their football. The kids are laughing amongst each other, high-fiving their adoring fans after goals and there is a spark that exists similar to that of the baby bombers in 1993. 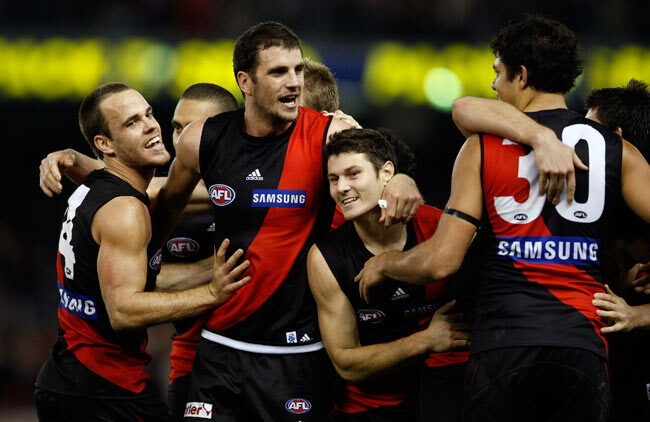 2011 promises to be one of the most exciting seasons at Windy Hill for quite some time and for the league’s sake, it would be fantastic to see the might Essendon Football Club back up towards the top of the ladder. With Collingwood all but having a spot booked in September, Andrew Demetriou must be starting to dream of a blockbuster final. This entry was posted in Football (AFL) and tagged AFL 2011, Essendon Bombers, James Hird, Mark Thompson, Premiership, Round 1, Western Bulldogs. Bookmark the permalink. And if they get smoked next week?
! win and you guys think your serious contenders hahaha i love it.